Happy Wednesday! Here's to getting over the hump of this week and sliding closer to the weekend. 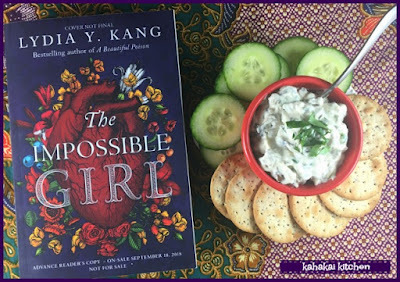 Today I am very excited to be on the TLC Book Tour for The Impossible Girl, the new historical mystery novel by Lydia Y. Kang. 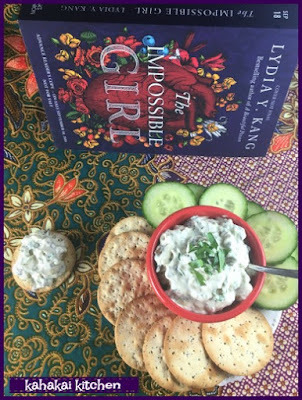 Accompanying my review is an easy recipe for a Smoked Oyster Pâté, inspired by the many oysters in the mid 19th-century New York City setting. There's also a Rafflecopter giveaway for an opportunity to win a copy of The Impossible Girl at the bottom of the post. Manhattan, 1850. Born out of wedlock to a wealthy socialite and a nameless immigrant, Cora Lee can mingle with the rich just as easily as she can slip unnoticed into the slums and graveyards of the city. As the only female resurrectionist in New York, she’s carved out a niche procuring bodies afflicted with the strangest of anomalies. Anatomists will pay exorbitant sums for such specimens—dissecting and displaying them for the eager public. OK, to get it out of the way and get on to the book review ... I LOVE the cover of this book! The color, the design, the way it fits the slightly macabre mystery vibe--Lydia Kang has some very cool book covers. 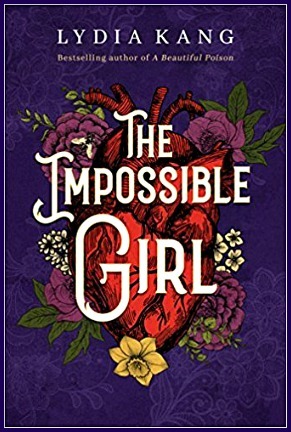 I am also fascinated by early medical practices and oddities and as in her previous historical thriller, A Beautiful Poison (reviewed here), the author makes good use of her medical degree and detailed research in The Impossible Girl. Cora Lee has a very big secret, she is the whispered about medical oddity, a girl born with two hearts--something that both physicians and side shows would pay a large amount of money to display. This makes Cora's job as ironic as it is unusual--she is the city's best and only female grave digger or ressurectionist, with her gang she digs up the bodies of wealthy, deceased New Yorkers with medical abnormalities, from a young woman with a four-inch tail and an unusually tall gentleman with "abnormally long limbs and fingers," to a woman with a neck tumor that has hair and teeth. Cora has a list of these potential finds and waits for word of their passings, but it seems like the bidders for these bodies are impatient as mysterious deaths are claiming Cora's list and rumors about the "impossible" two-hearted girl are growing. Author Notes: Lydia Kang is a physician and the author of A Beautiful Poison. She was born in Baltimore, Maryland, and graduated from Columbia University and New York University School of Medicine. She currently lives in the Midwest with her family, where she continues to practice internal medicine. 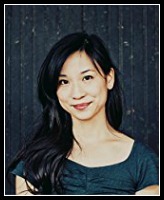 Visit her at www.lydiakang.com. Connect with Lydia on her blog, Facebook, Twitter and Instagram. There is a lot of food in The Impossible Girl--a good portion of it oyster-related (see note below). Mentions included pork joint, pastries, flour, boiling soup, meat pies, pudding, blueberries and blackberries, coddled eggs, currant buns, moldy bread, a dinner of pork roast, boiled potatoes and flour biscuits, bread and cheese, peppermint candy, roast goose, roast beef, clam soup with extra bread and butter, mutton and taters, "fine Croton water" (The Old Croton Aqueduct was a large and complex water distribution system constructed for New York City between 1837 and 1842), malt liquor, brandy and German lager, cakes, raspberry cordial, coffee, a warm, sweet loaf speckled with raisins, and sweet buns, punch, baked eggs, tiny pies--both savory and sweet including oyster, egg and ham pies, treacle, cheese and crabapple jelly, beef tea (broth), jam, buttery gruel, gin, wine, baked eggs, tea, slices of roast ham and bread, apples, chicken, whiskey, rum, iced cake, and plain buns from the bakery. Oyster mentions from the various saloons included a plate of raw oysters and oysters fried, baked, stewed, roasted, stuffed in a fowl, oyster pie, and duck in oyster sauce, and a steaming plate of oysters, dotted with black pepper. Sometimes a book calls for a certain dish or ingredient. In this case it was definitely oysters as their consumption at seedy oyster cellars and bars were a key setting in the book. Here's a fun article from the New York Times on the abundance and popularity of oysters in the mid 19th-century: City Lore: When the Oyster Was Their World by Mark Kurlansky. 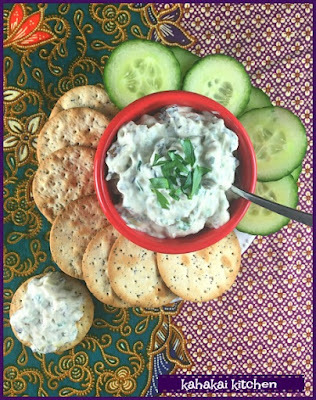 I knew I wanted my dish to center around oysters and since good, fresh or fresh-frozen oysters are not that easy to get reasonably here, I wanted to make something with canned oysters. Other criteria was it had to be fast-to-make and something I would eat (oysters and I are a bit tentative in our relationship--we hang out very occasionally if we must, but don't gravitate to each other). My mom used to make oyster stew, but it's just too humid for that and so I decided to forgo any historical accuracy of recipe and go for a more modern and easy dip. There were plenty of recipes to be found but I liked the sound and ingredient list of the Smoked Oyster Pâté recipe I found at Food52. I made two tiny changes--noted in red below. In a medium bowl, pour the cream cheese, milk, green onions, Worcestershire, Tabasco, garlic, and parsley. Stir to combine. If the mixture seems too thick, thin it with a teaspoon or two more milk. (It should be thick but everything should be evenly blended.) Fold in the oysters. Season to taste with salt and pepper.